Canada has lots of gourmet desserts with enough calories to keep someone going for several days. My significant other has an insatiable sweet tooth, and so we often explore the Greater Toronto Area to find fun and new desserts for him to try. Over the last couple of years, one dessert they keep going back to is the mighty Hungarian chimney cone from Eva’s, a local confectioner that cranks out gorgeously delicious chimney cones that may or may not come served with a huge amount of gourmet ice cream and toppings. If you find yourself in the GTA, do yourself a favour and grab a chimney cone even though you’ll be cheating on your diet quite a bit, but I promise they really are worth it. What is a Chimney Cone? Also misleadingly known as doughnut cones, chimney cones are ” freshly baked Eastern European treats known as Kürtőskalács (Hungarian) Trdelník (Czech) or Chimneys in English.” My partner finds them reminiscent of churros, which sounds about right because Eva’s coats the sweeter cones in a delicious cinnamon-sugar blend. The point is, chimney cones are baked deliciousness that can be sweet or savoury and Eva’s lets you get either. Chimney cones took the GTA by storm over the last couple of years, and it’s for good reason! The chain offers empty chimney cones, or chimney cakes, that you can top with everything from shredded coconut to grated cheese. The cones are also lined with a delicious sauce of your choosing, though all the choices are on the sweet side with options like whipped cream or cream cheese icing on the menu. Most people go for the chimney cones, though, because the ice cream chimney cones are gorgeous and delicious. My and my boyfriend’s favourite is the dream cone, a towering cone and ice cream swirl drizzled with salted caramel, with toffee, brownies, and other goodies added to the mix. 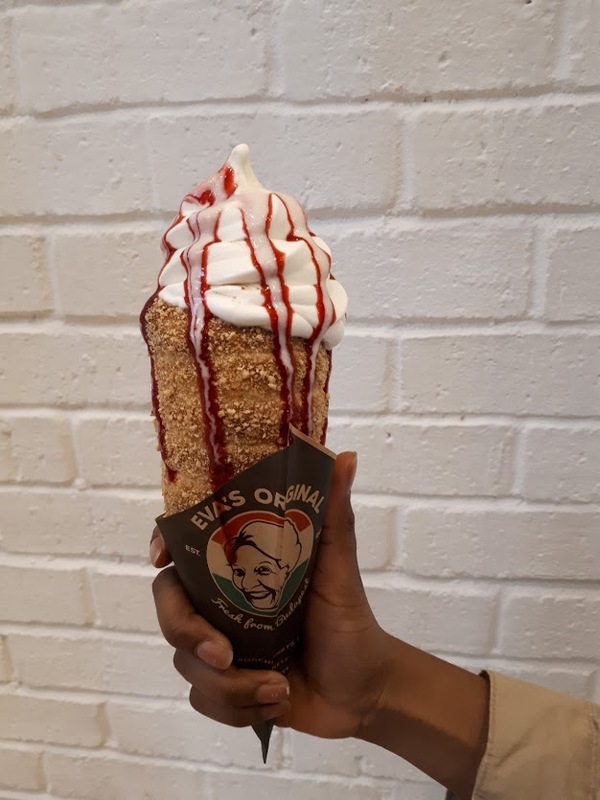 You can view Eva’s menu on their website here, and find out if you can get your chimney cone fix somewhere near you!